This project is a hardware and software package for programming the X22C12 EEPROM in the GE Phoenix SX radios (specifically the VHF 16 channel scanning version). 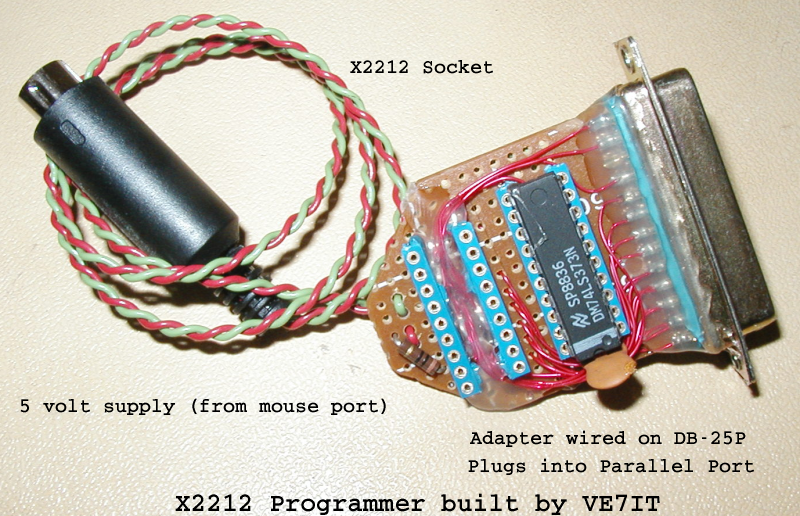 The X2212 is removed from the radio, placed in the parallel port adaper socket and can be read/written/verified or archived. The prom contents can be saved in a hex file format or exported as a text file for printing. Changing frequencies and channel guard settings is as easy as filling in the blanks. The software package is distributed as a linux tar file complete with all source code. You will need gnome2/gtk2 libraries installed to build the program. It should build on most recent distibutions (tested on RedHat 8.0). If you have ever programmed one of these radios with the old suitcase programmer by computing 256 hex bytes and entering them one at a time, you will really appreciate this software. I'm not sure if it will work for the UHF version of this radio. If anyone has a radio to donate the the cause, I would be glad to add whatever is required to make it work. A linux computer (Redhat 8 or later suggested) that contains the gnome2 and gtk2 development software. Glade-2 is required if you wish to edit the screen formats or add more entry boxes. If you have problems building with autotools, the glade project notes may help. let you know by letting the smoke out of the resistor! ).